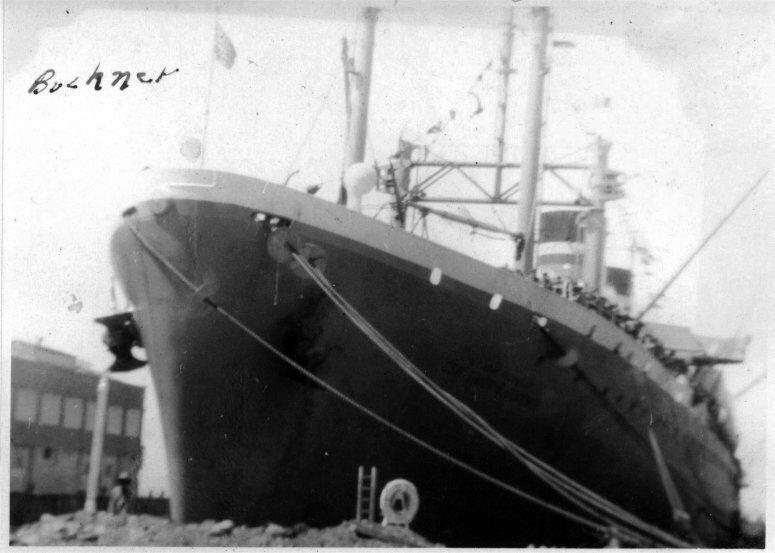 Laid down, 15 February 1943, as a Maritime Commission type (P2-SE2-R1) hull, under Maritime Commission contract (MC hull 681), at Bethlehem-Alameda Shipyard Inc., Alameda, CA. Final Disposition, dismantled in May 1999 at International Shipbreaking Co., Brownsville, TX. Cargo Capacity 100,000 cu. ft.
four turbo-drive 400Kw 450V A.C.
two turbo-drive 200Kw 120V/240V D.C.
70k "Going down the ways is the U.S.S. 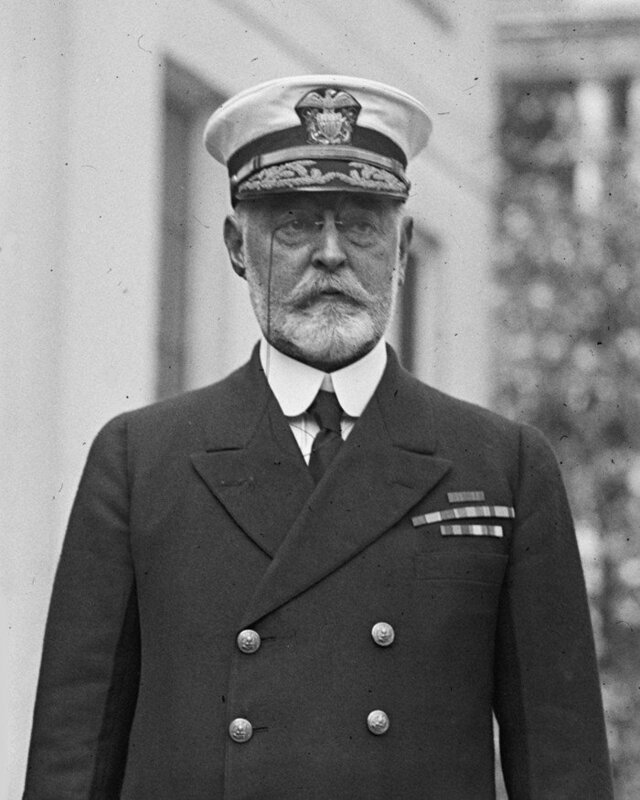 Admiral E.W. 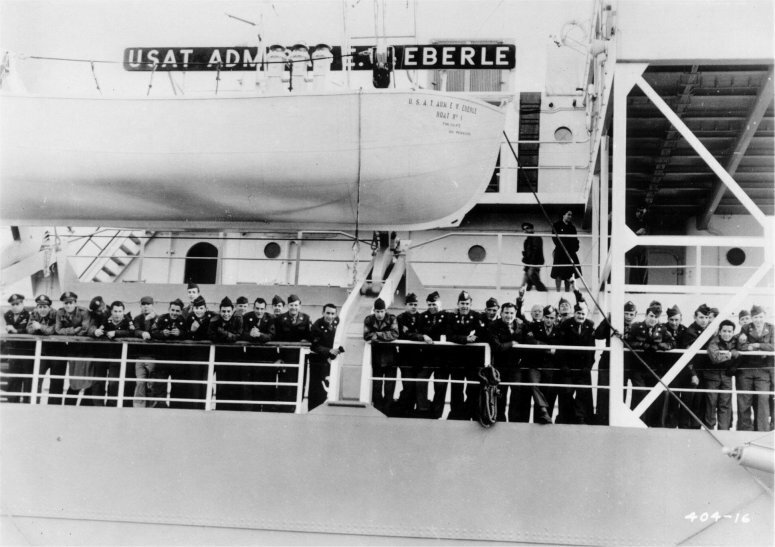 Eberle, launched, Wednesday, June 14, at the Alameda shipyard of Bethlehem-Alameda Shipyard, Inc. 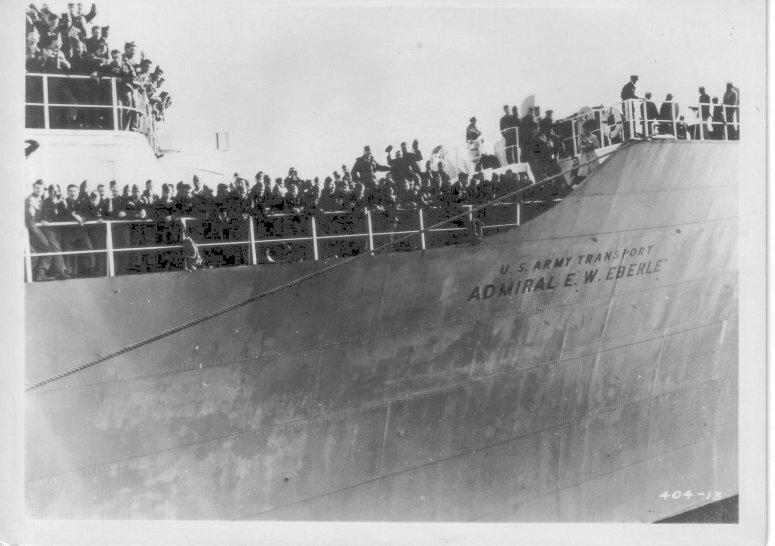 Sponsor of the vessel was Mrs. Earl Warren, wife of Governor Warren of the State of California. 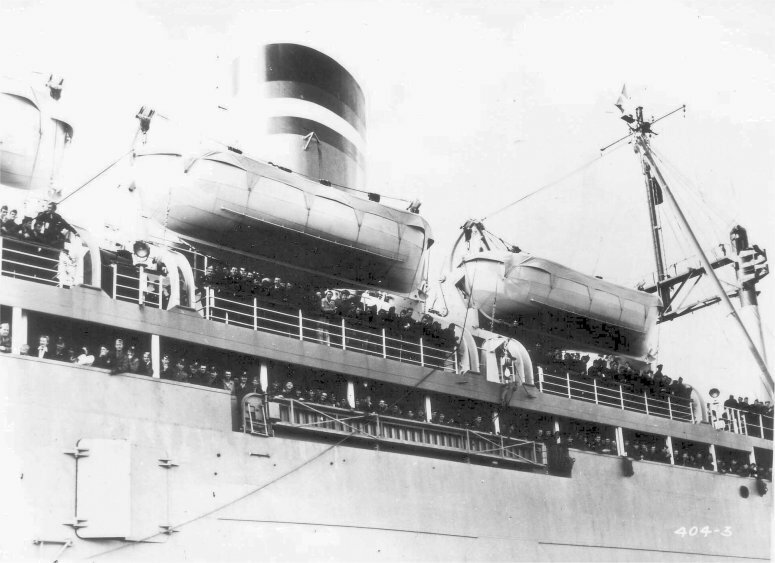 Guests at the launching from Oakland included. Mrs. James C. Warren, Commander and Mrs. Oscar Johnson, Mrs. W.E. Joost, Miss Katherine Joost, Lieut. William Joost, Mr. and Mrs. John F. Mullins, Mr. and Mrs. George C. Perkins, Mrs. V.R. Plank, Mr. and Mrs. Charles W. Real, and Mr. and Mrs. David Wilson; from Sonoma, Mrs. James Ross Gordon, and Mr. and Mrs. James Ross Gordon, Jr.; Mr. and Mrs. J.J. Mulvany from Alameda; and Mr. and Mrs. D.W. McElwain from Berkeley; and Mrs. B.F. Jesses from Sacramento. With Governor and Mrs. Warren were their children Virginia, Earl Jr., Dorothy, Nina and Bobby." 71k A halftone reproduction of a photograph of USS Admiral E.W. 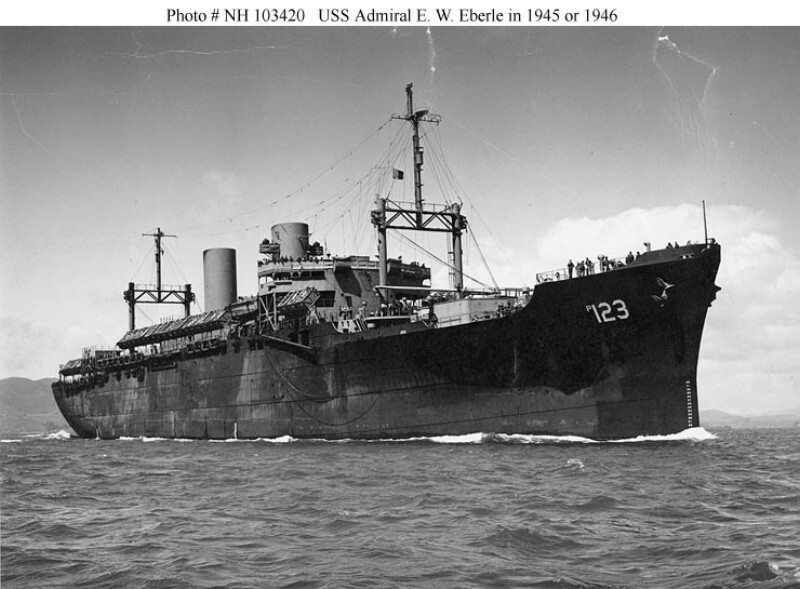 Eberle (AP-123) taken in 1945 by her builder, Bethlehem-Alameda Shipyard Inc, of Alameda, CA. Copied from the book "Troopships of World War 11", by Roland W. Charles. 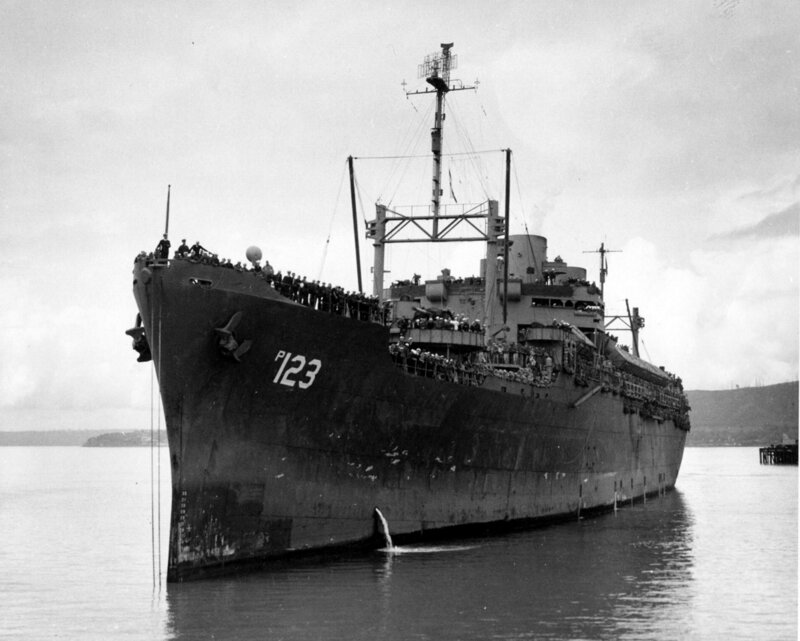 255k USS Admiral E.W. 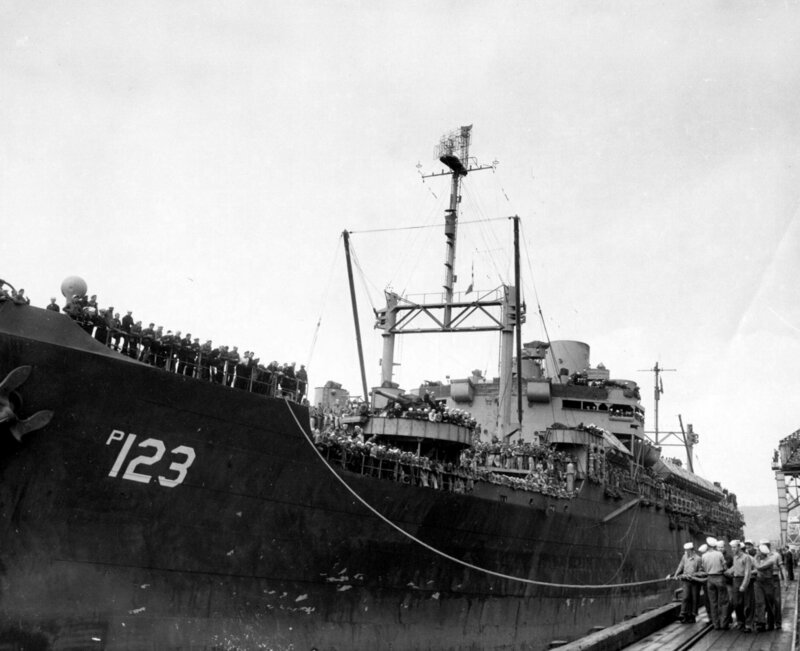 Eberle (AP-123) carrying 134 officers and 4,369 enlisted men, docking at the Port of Tacoma piers, 23 September 1945. 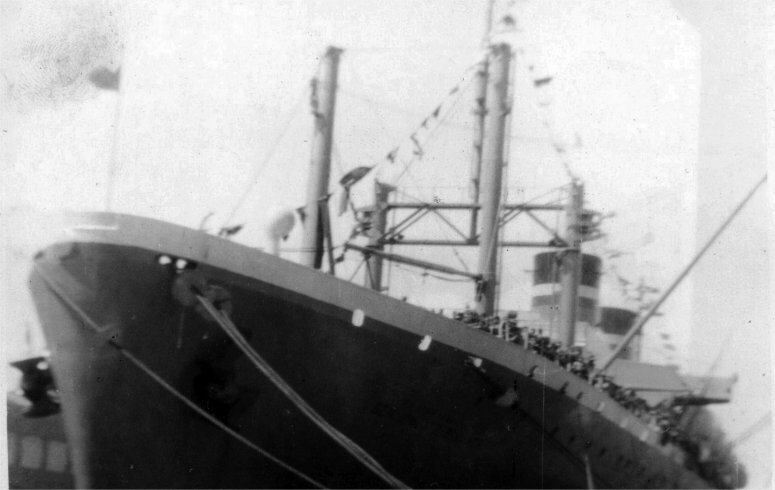 The military personnel aboard were the first to land at Tacoma since the end of World War II. 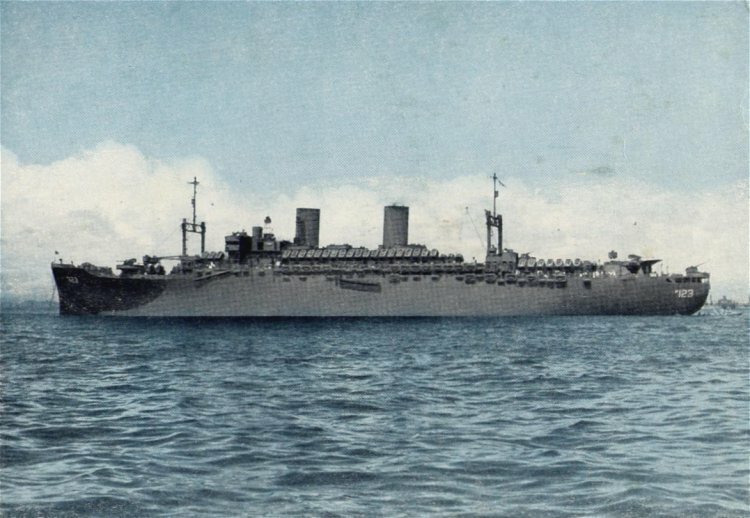 104k USS Admiral E.W. 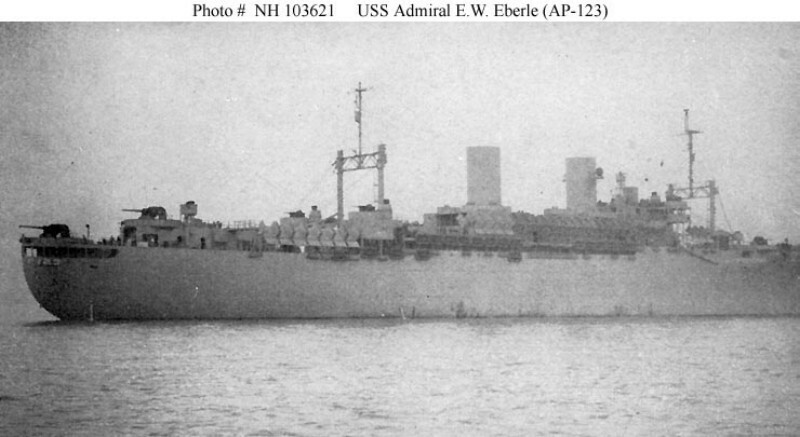 Eberle (AP-123) underway, possibly in San Francisco Bay, circa late 1945 or early 1946. 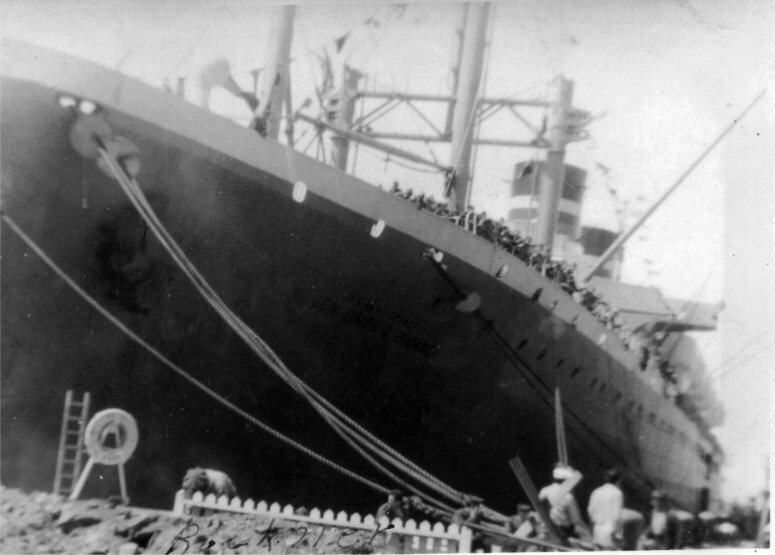 Note the ship's four 5"/38 guns have been removed. 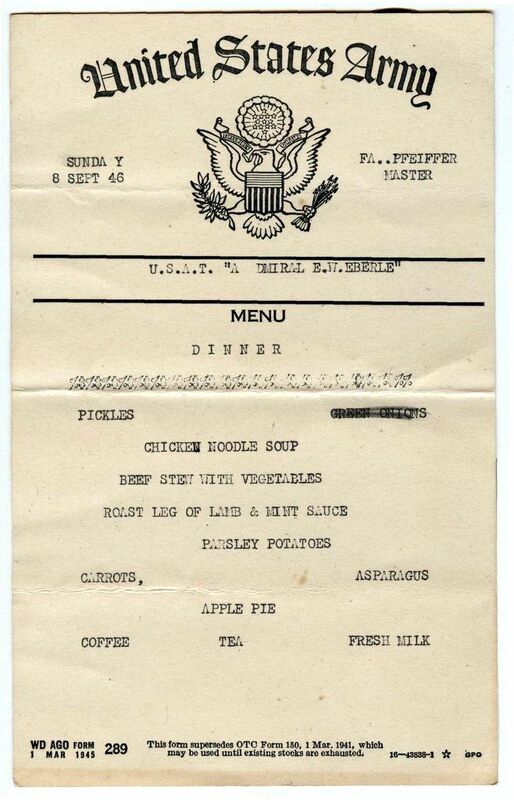 This probably occurred during an upkeep period at Seattle in September 1945. 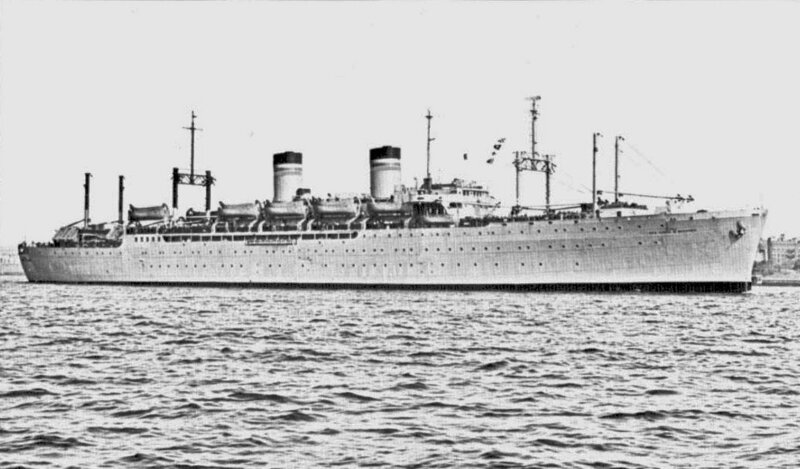 318k USS Admiral E.W. 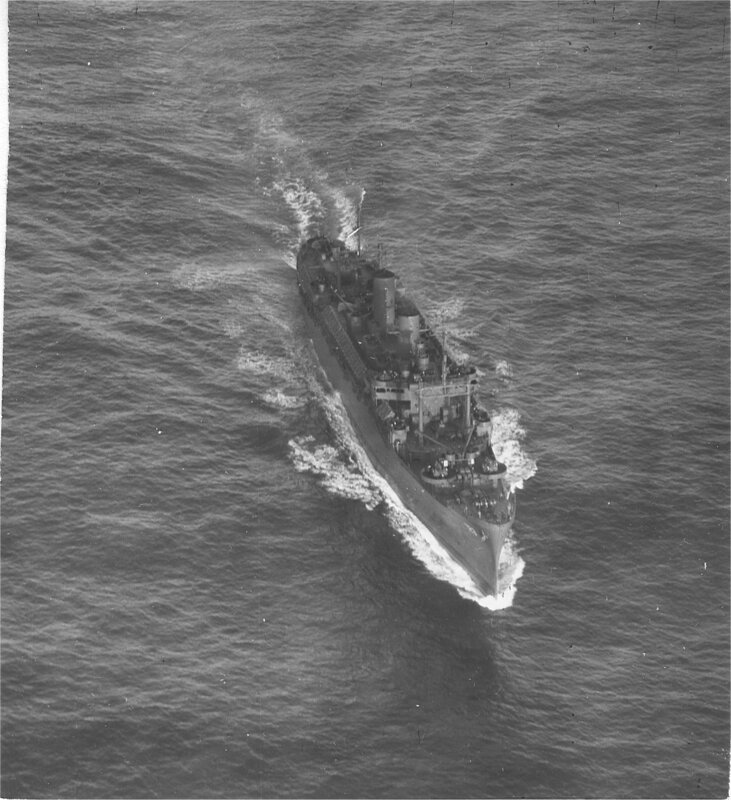 Eberle (AP-123) underway, off the northern California coast, circa late 1945 or early 1946. Simon Bolivar Buckner, born 18 July 1886, in Munford-Fille, Ky., attended the U.S. Military Academy, West Point, and was commissioned Second Lieutenant of Infantry 14 February 1908. From 1908 to 1918 he served both in the United States and the Philippines, then assumed administrative demobilization duties following World War I. During the next two decades he served as instructor and administrator at various posts throughout the United States, including the U.S. Military Academy. In October 1939 he was assigned to the 6th Division as Chief of Staff, and appointed Brigadier General 1 September 1940. During World War II he commanded American troops in Alaska, with headquarters at Fort Richardson, Anchorage. He was promoted to Lieutenant General 4 May 1943 to assume command of the 10th Army August 1944. 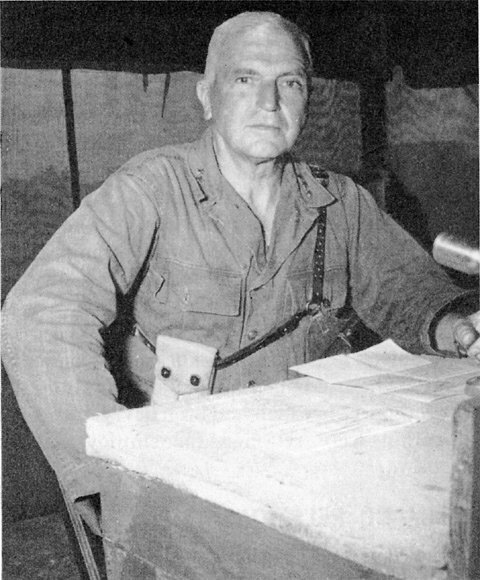 With overall command of the landing forces on the doorstep of Japan, General Simon B. Buckner was killed in action on Okinawa 18 June 1945. 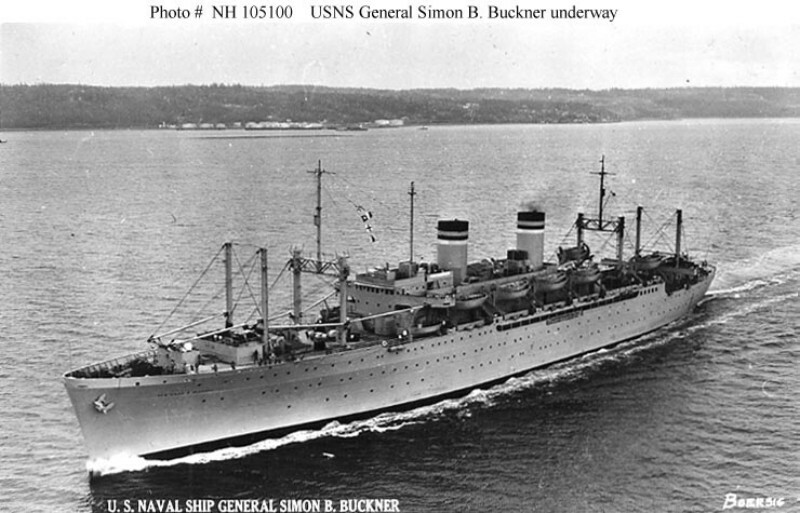 75k USAT General Simon B. Buckner photographed circa 1946-1950. The original image was printed on postcard stock. 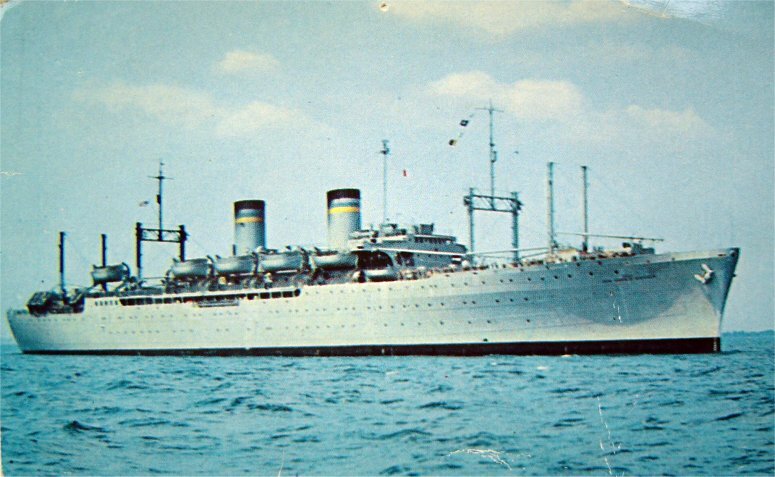 62k USNS General Simon B. Buckner (T-AP-123) under way circa 1950s-1960s, location unknown. 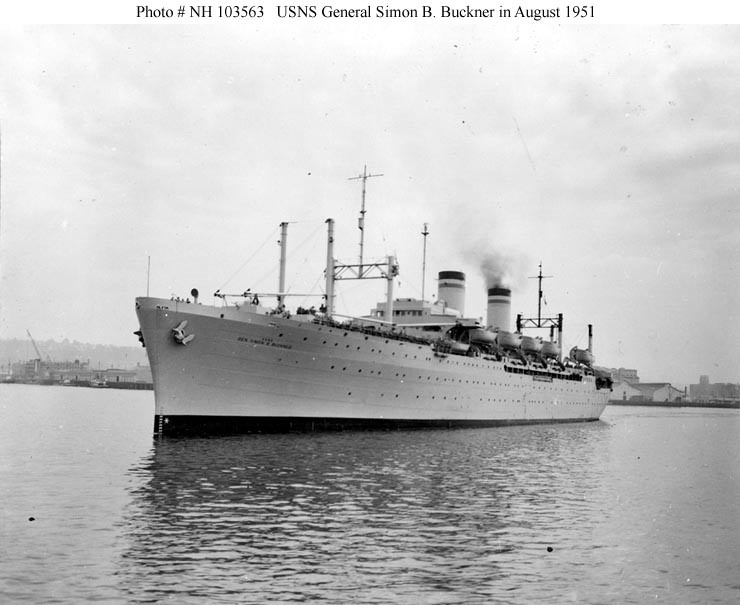 155k USNS General Simon B. Buckner (T-AP-123) under way circa 1950s, location unknown. 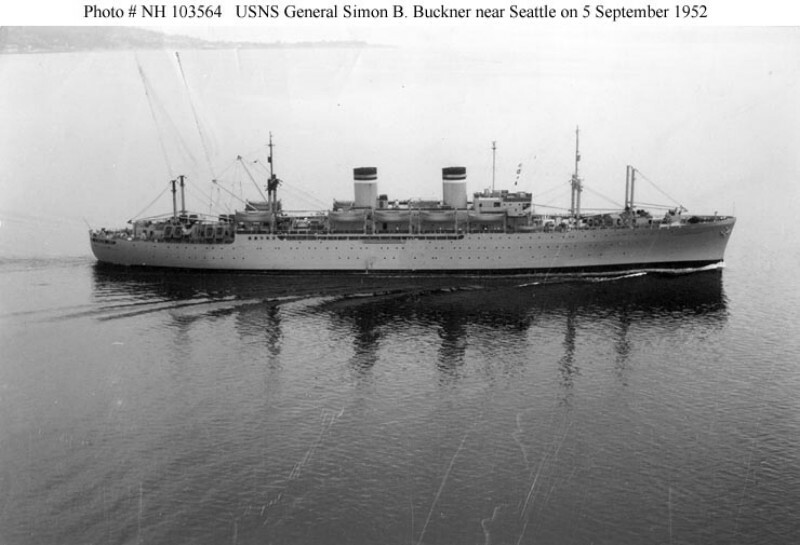 78k USNS General Simon B. Buckner (T-AP-123) photographed while underway in the Puget Sound area from an aircraft based at NAS Seattle, WA., 5 September 1952. 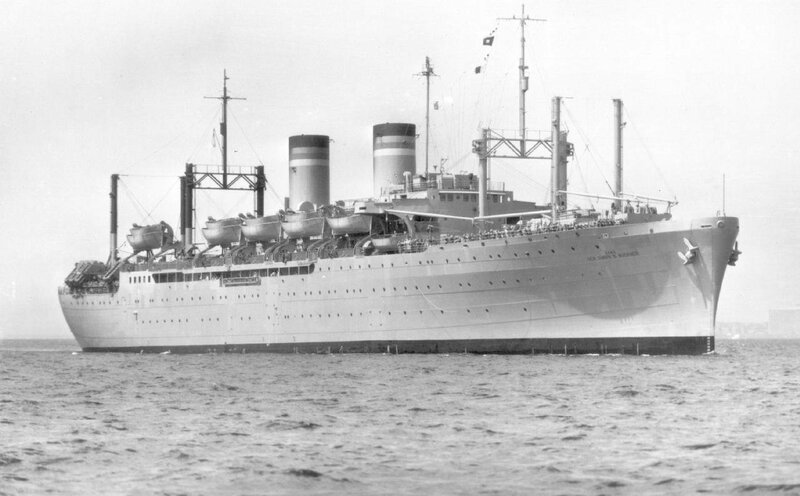 118k USNS General Simon B. Buckner (T-AP-123) underway during the 1950s. 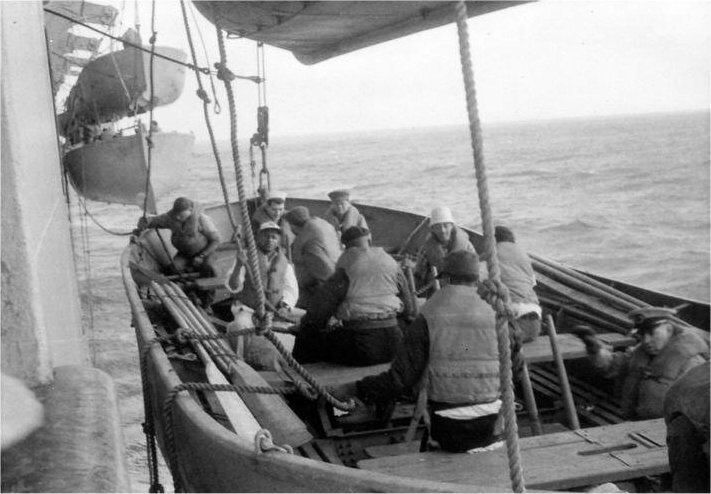 Photographed by Boersig. 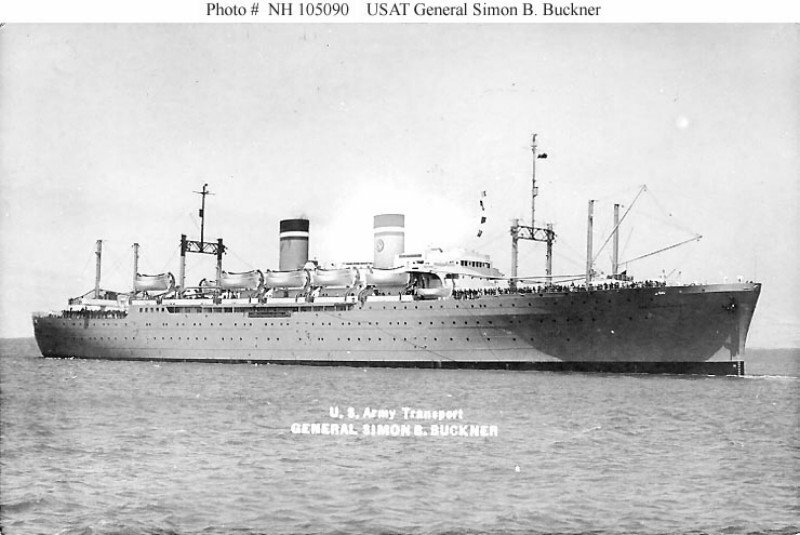 The original image is printed on a postcard published by the Military Sea Transport Service (MSTS) for sale in Buckner's ships' store. 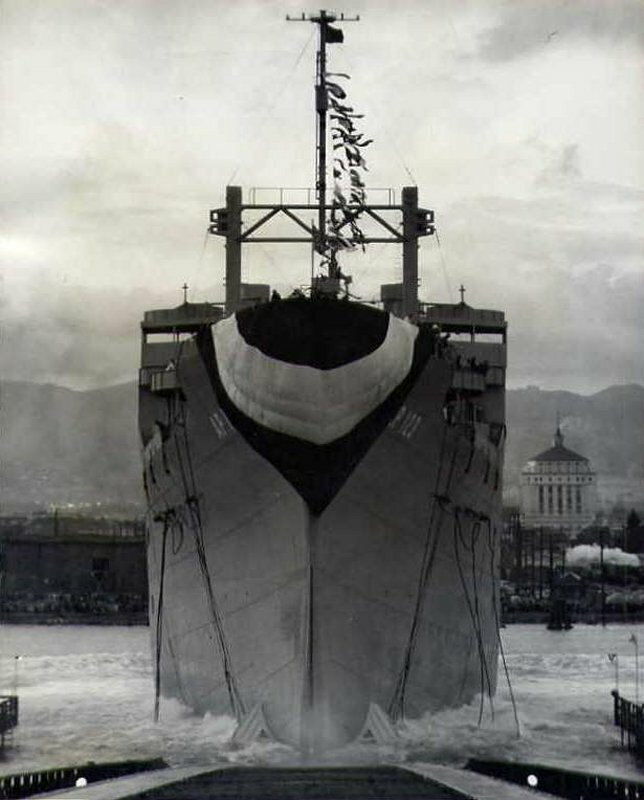 76k USNS General Simon B. Buckner (T-AP-123) underway off Fort Mason, San Francisco, CA., in March 1955. 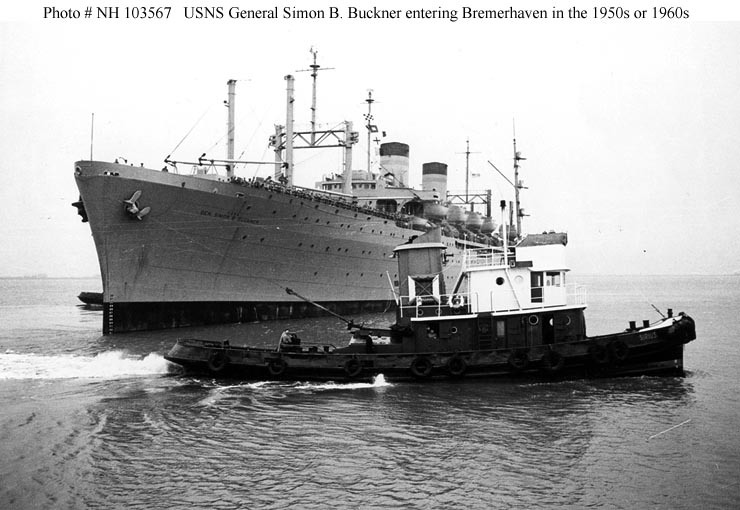 75k USNS General Simon B. Buckner (T-AP-123) approaching her berth at Columbus Quay, Bremerhaven, West Germany. The tug Sirius is assisting. 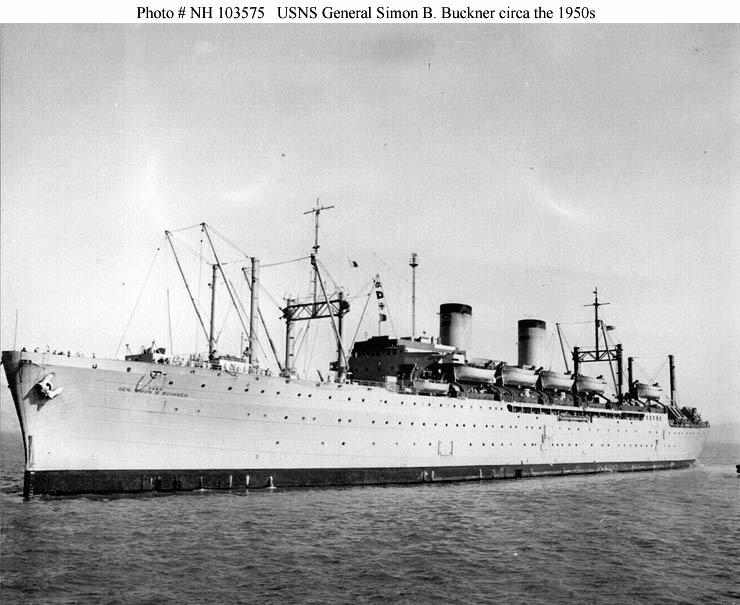 USNS Simon B. Buckner served on the New York to Bremerhaven route between 1955 and 1966. 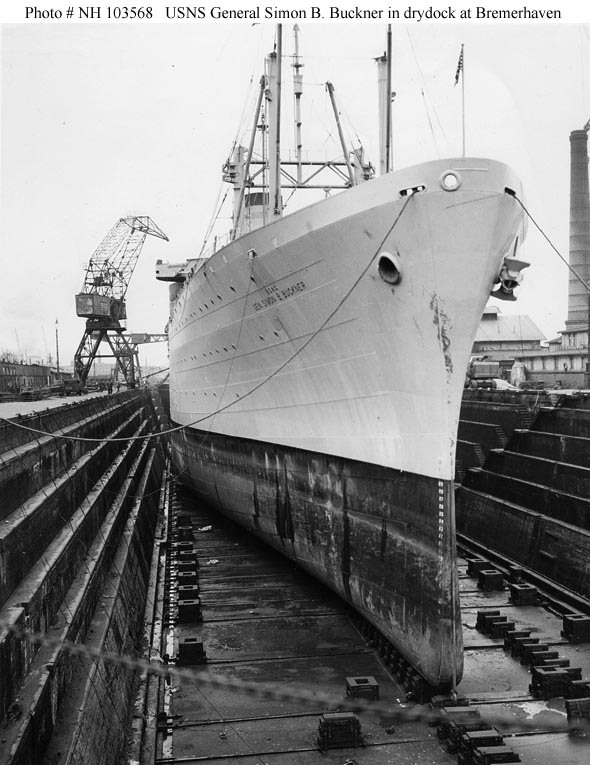 91k USNS General Simon B. Buckner (T-AP-123) in drydock at the North German Lloyd shipyard at Bremerhaven, West Germany after suffering ice damage to her propeller structure in the Weser River during the previous winter. 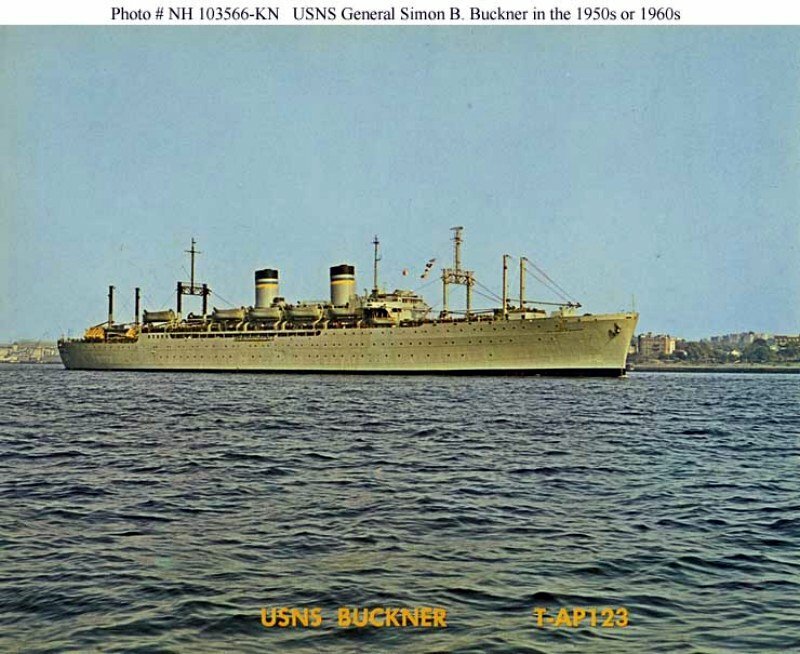 120k A letterpress reproduction of a photograph USNS General Simon B. Buckner (T-AP-123) taken in the 1950s or 1960s. 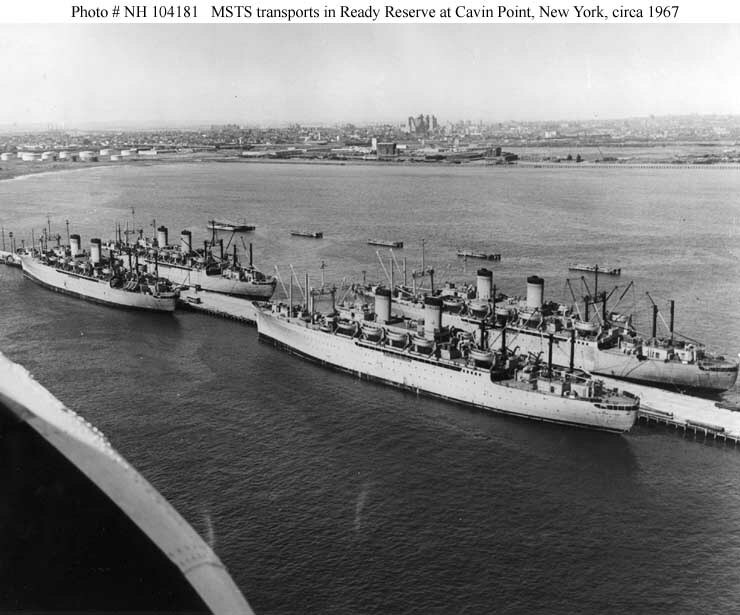 70k Four MSTS Atlantic Fleet transports in Ready Reserve at Caven Point Army Depot, New York, circa early 1967. The ship in the right foreground is USNS General Simon B. Buckner (T-AP-123), with USNS General William O. Darby (T-AP-127) on the far side of the pier. Ahead of them respectively are USNS General Alexander M. Patch (T-AP-122) and USNS General Maurice Rose (T-AP-126). .